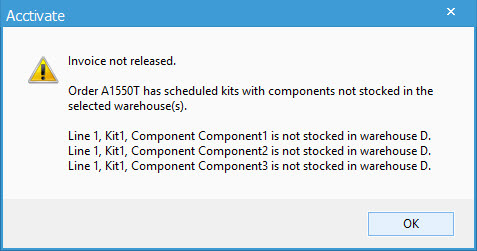 This message means that the kit product and one or more of its component products are not stocked in the same warehouse. When selling a kit, it’s a requirement for the components to be stocked in the same warehouse as the kit itself. This means selling a kit product out of the F warehouse will require the components to be stocked in the same F warehouse. It is important to note that products found in kits can often be sold either by themselves, or can be pulled together with other products to sell as a single unit. When making a kit product, remember a kit is a non-inventoried product ‘group’, comprised of inventoried components, therefore if a Kit and Component are not stocked in the same warehouse, the component cannot be included as part of the kit. If you have additional questions or need assistance Please Contact Support.